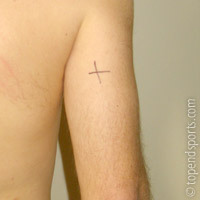 The triceps skinfold site is one of the common locations used for the assessment of body fat using skinfold calipers. See the complete list of skinfold sites, and the general procedure for taking skinfold measurements. At the level of the mid-point between the acromiale (lateral edge of the acromion process, e.g. bony tip of shoulder) and the radiale (proximal and lateral border of the radius bone, approximately the elbow joint), on the mid-line of the posterior (back) surface of the arm (over the triceps muscle). The arm should be relaxed with the palm of the hand facing forwards (supinated). A vertical pinch, parallel to the long axis of the arm, is made at the landmark. If you are unsure if you have pinched only skin and no underlying muscle tissue, ask the subject to flex the muscle while you have a pinch.